ELDO, the European Launcher Development Organization, was an international organization formed in 1964 to develop a satellite launch vehicle. Members were Australia, Belgium, France, Italiy, The Netherlands, the UK and Germany. The development program was terminated after a series of launch failures and the organisation was absorbed into ESA 1975. The work within ELDO was distributed among its members ain proportion to their financial contributions. The Europa rocket consisted of the stages Blue Streak (UK), Coralie (F) and Astris (D). The first five test launches during 1964-1966 were made with only the Blue Streak first stage and four of these tests went well. During 1967 two test launches with a live second stage were carried out. Both failed. 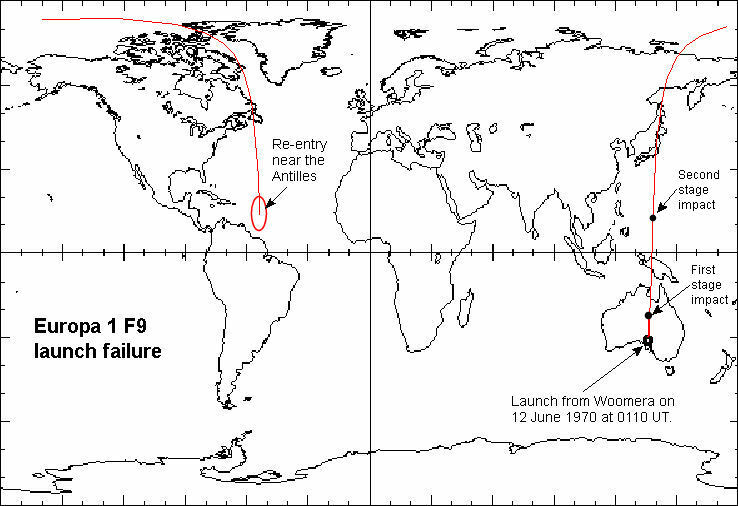 During 1968 and 1969 there were two launches with all three stages live and both failed. In June 1970 it was time for the tenth test (F9). Just as with the two previous launches the rocket carried a test satellite. 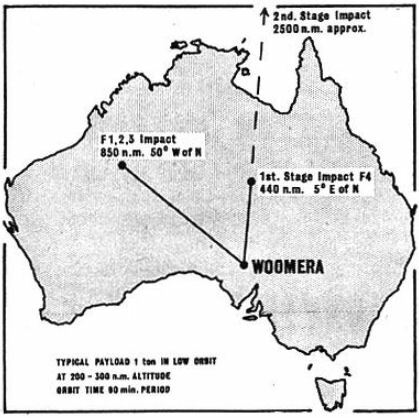 All launches took place at Woomera in Australia except the last launch (in 1971) which took place at Kourou in French Guiana. So, F9 was the third attempt to put a test satellite (STV-3, Satellite Test Vehicle) of about 250 kg into orbit. The main purpose of these test satellites was to record the flight environment during ascent. The satellites were octagonal in crossection and prismatic. The integrating contractor was Fiat Aviazione. 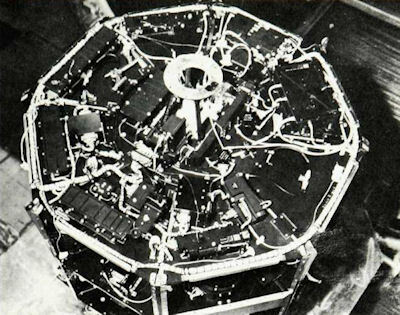 ELDO had agreed with five member countries of CETS (the European Conference on satellite communications) (4) to fly experimental telecommunications equipment on the Europa 1 F9 launch originally scheduled for October 1969. The countries concerned were Belgium, Italy, Denmark, Norway and Sweden. This offer of payload space - 50 liters (5 ) - had been made several years earlier by ELDO, on the understanding that the launcher organisation would not be affected technically or financially and that the launch date would not be delayed on account of possible payload problems. Three experiments were flown. The first was a VHF tracking beacon by Belgium. The second, by Italy, was an aerial system and the switching system necessary for the experiments. The third, a joint effort by Denmark, Norway and Sweden, was a UHF transponder weighing 25kg, and capable of relaying one television channel. Integration of the equipment into the satellite structure was be done by Italy. Three Earth stations, Fucino (Italy), Råö (Sweden) and Tromso (Norway) were to be involved with these experiments (3). The transponder had a 6 GHz uplink and 4 GHz downlink. Ericsson made the 4 GHz transmitter, the local oscillator for the 6 GHz receiver and power conditions circuits for the solar panel power (5 ). At Råö the 4 GHz receiving chain for the communications experiments via NASA's Relay 2 satellite in 1964-1965 was probably foreseen to be used. So presumably signals were intended to be sent from Fucino to Råö and Tromsö. The Swede Henry Schefte, from the technical staff in Ericsson corporate headquarters, represented CETS in Woomera where he arrived a week before the launch. (2 ) . This pionnering work was carried out at Ericsson's military electronics division in Mölndal near Gothenburg. At this site work on radar- and other microwave technology was perfomed, i.a. for the Saab Viggen military aircraft (6 ). "... 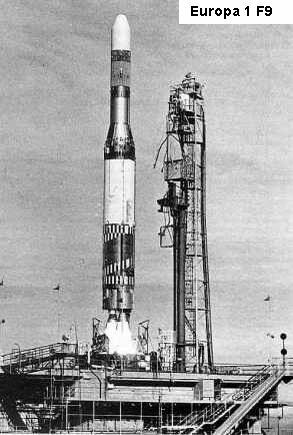 The launch was orginally planned for 19 May 1970 but because of technical issues with various rocket stages the launch was moved to 10 June. On that day the final phase of the countdown started at 0300 local time (9 June at 1730 UT) but had to be interrupted by some problem in the ground equipment. It was not possible to solve the problem that day so it was decided to try again the following day. On Thursday 11 June at 0300 (10 june 1730 UT) the countdown was started again. Everything went smoothly until T minus 2 min 59 sec when a hold was called. This time the problem was aan unsynchronized station clock and the problem was quickly solved. The countdown was picked up again but was soon interrupted again when a hitherto unnoticed U.S. satellite appeared over the horizon. This satellite transmitted on teh same frequencies as "our" satellite and significantly interfered with the ground stations to be used during the launch. When the U.S. satellite had moved away the countdown was pcoied up but again a hold was caled - this time because of a faulty computer on the ground. It was now 11 o' clock (11 june 0130 UT) and the elevation of the sun prevented additional launch attempts that day because the sun was interfering with optical trackers that were used to follow the inital phases of the flight. So, on Friday 12 June the countdown started at the same early hour, i.e. 0300 (11 juni 1730 UT). After a one-hour hold to let the U.S. satellite pass the countdown proceeded to T minus 2 minutes when the automatic countdown sequencer ordered another hold. Again, a ground computer was the culprit. The problem was solved and the countdown was picked up. This time all subsystyems worked and the 105-tonne rocket slowly took off at 1040 local time (0110 UT). Two main problems prevented the rocket from placing the satellite into orbit. Telemetry showed that a connector in the upper stage had fallen off the rocket at T+79 seonds when the rocket passed max Q. Through this connector the impulse to fire the explosive bolts to release the 300 kg shroud was to have been relayed at T+122 seconds. So the third stage had to carry an additonal load of 300 kg which slowed it down. In addition the thrust of the engine of the third stage decreased and became unstable near the end of it burn time. So, instead of entering orbit the third stage and the satellite decayed into the Atlantic in the vicinity of the Antilles. So, the Belgian-Scandinaian telecom experiment could not be performed in orbit via ground stations in Tromsö (Norway), Fucino (Italiy) and Råö in Sweden. 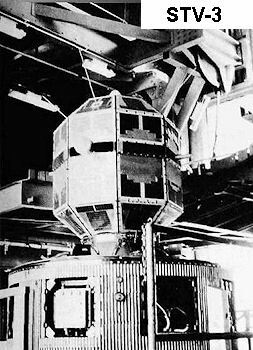 Howeveer, the experince gained in designing and testing of space-qualified systems will be very important for future space projects..."
A somewhat fuzzy picture of the inside of the STV-3 from (1) is reproduced below. The map below shows the flight azimuths for the early launches with only the Blue Streak without even dummy upper stages and for the later flights when dummy or live upper stages were carried. "Carrier rocket with Ericsson equipment", Gunnar Wenneberg, Kontakten , newsletter for Ericsson staff, 1970/6. pp. 82-83. Henry Schefte (1925-1998) belonged to Ericsson's top management and formulated key elements in the company's strategy for fiber optics, radio links and satellit communications. Henry Schefte had strategic responsiblity for Ericsson's effort in satellite communications and was tehrefore very influential in the studies of a possible Nordic broadcasting satellite system, Nordsat, and in the technical specifications for the Tele-X geostationary broadcasting and data communications satellite launched in 1989. Flight International, 6 March 1969, p. 373. After the United States' proposal for the creation of a world telecommunications system, Intelsat (International Telecommunications Satellite Organisation), the European countries established an institution dealing specifically with satellite communications, namely the European Conference on Satellite Communications (French acronym CETS). The purpose of this conference was to draw up a common European policy for the impending negotiations with the United States, and the other member countries of the European Conference of Postal and Telecommunications Administrations (CEPT). Although ECSC was not institutionalised by any legal act, it was at first very active: August 1964 saw the signing of the Interim Agreement to form the International Satellite Consortium, which would become Intelsat. The period 1964-71 was devoted to negotiation of the agreements on the final form of Intelsat which entered into force on 12 February 1973. However, the analysis of the institutional, technical and economical implications of the project led the European Space Conference, at its meeting of October 1968 in Bad Godesberg to take the matter of a European communication satellite programme out of CETS's hands and refer it to European Space Research Organisation (ESRO) and European Organisation for the Development and Construction of Space Vehicle Launchers (ELDO). Consequently CETS, having lost its "raison d'être", ceased all activity in 1970. "The LME group's engagement in space activities", Henry Schefte, Kontakten, newsletter for Ericsson staff, 1968/3, p.37. Swedish Society for Aeronautics and Astronautics, member newsletter Bevingat Nr 1, 2008, p.3.